I’m 29, but I don’t look a day over 30. 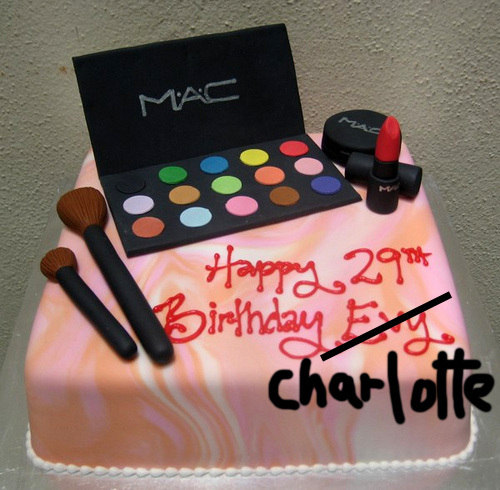 The astute amongst you may have noticed that this isn’t my actual Birthday Cake (I’m sorry Evy… whoever you are). P.S. I don’t know about you, but that MAC looks kinda fake to me. I love that cake too! Is it wrong that I want that cake, just to look at? Even though it isn’t my birthday? Happy Birthday lovely, have a brilliant day! I love the cake too btw.. I wish I could have one like it! It’s my birthday too! Happy birthday to us! Have a great day. Happy Birthday gorgeous Lady! We wanna see a pressies post!!! Happy birthday! That cake would be too pretty to eat anyway and it’d just be a waste! that cake is genius! Awesome Googling skills! Happy happy birthday. Wishing you a fantastic year ahead. and yes that MAC does look fake to me. It’s my birthday too! Only I’m turning 20.
that cake is the best evar! Happy Birthday! Ooh, I would love a cake like that! And lol at your reasons for not getting a MAC cake! I’m not sure I would like to eat a bday cake like this one, how does the (fake) MAC palette taste ??? Happy Birthday! I’m official 10 years old then you. LOL! A happy birthday to you! Mine was the 15th, and I also didn’t have a very elaborate cake. It was an ice cream cake, though, and that’s good enough for me! I’ve been lurking on your blog for a few months now, in fact this is the first time I’ve ever posted a comment on any blog. Happy Birthday! I want a cake like that it’s adorable! Hope you got a real cake instead and some real makeup too. Hi Charlotte, Officially Ive missed your Birthday, but Happy 29th Birthday anyway!! Hope you had a great day! Happy birthday! I just turned 27 a couple of days ago! Haha, I was JUST researching what fake MAC palettes look like, and the minute I saw that cake I thought to myself “hm, that looks like a fake MAC!” …And then I realized that, yes, it WAS a fake MAC, but not the kind of fake I was thinking of. This kind of fake is probably more worth the money than the fakes I was looking at before. Happy birthday to you!